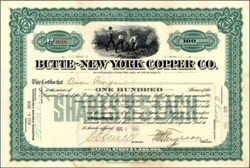 Beautifully engraved certificate from the Butte- New York Copper Company issued in 1914. This historic document was printed by the American Banknote Company and has an ornate border around it with a vignette of men working. This item is hand signed by the Company’s President (M.M. Ferguson) and Secretary (C. E. Connell) and is over 89 years old. The certificate was issued to Owen Morgan. The company was incorporated in South Dakota and controlled the assets of the Butte - Milwaukee Copper Company. 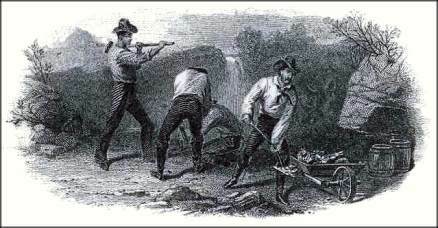 The Butte New York's holdings consisted of the Pollock Colonel Sellers, Florence, and Bird patented claims lying immediately north of the Butte and Superior Claims. The company was alos controlled by the Butte and Superior Mining Company.